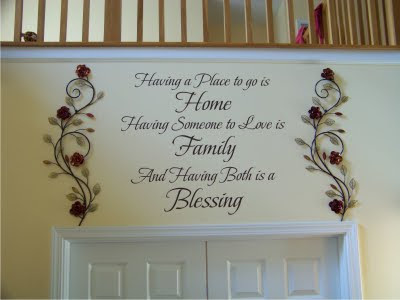 Deb loved this Home, Family, Blessing design from our Entryway wall quotes collection, but needed to change it a bit to fit her space a little more appropriately. So we worked closely together adjusting here, tweaking there until it was just right. And tada! It turned out beautifully. Thanks for sharing this photo Deb - we love how you've used it in your home. This month's $50.00 gift certificate is yours and we can't wait to see how the next project turns out. Cheers! *Want to win a $50.00 gift certificate of your own? Send a photo (or two) or your new wall quote to info [at] wallquotes [dot] com and you'll have your very own chance to win. woot woot!